Our Technica BrandⓇ Xerox Paper Feed Roller Kit is an identical replacement and a cost saving to the more expensive Xerox brand. 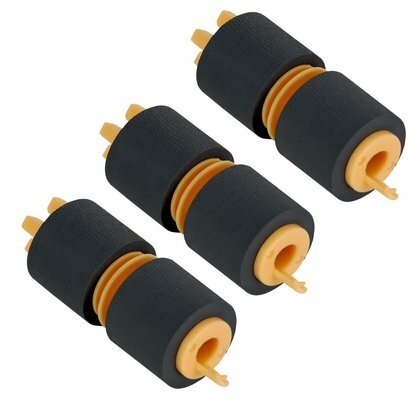 Kit is OEM identical and contains: 3 - Paper Feed Rollers. Kit is compatible with the following Xerox part numbers: 675K82240, 604K66430, 675K82242, 604K56080, 109R00790,109R790, 22K74870, 675K86570, 675K67050. For use in the following Xerox models: Phaser 7500, 7800 Series, Workcenter 5325, 5330, 5335, 7120, 7125, 7220, 7225, 7425, 7428, 7435, 7525, 7530, 7535, 7545, 7556. All compatible Technica Brand Ⓡ products from Wholesale Imaging Products are guaranteed to meet or exceed the print quality and life of the original Xerox brand. Wholesale Imaging Products is the exclusive US distributor of Technica Brand Ⓡ office machine parts & consumables. A portion of our proceeds supports Wounded Warrior Project. If you have any questions about this product by Technica BrandⓇ, contact us by completing and submitting the form below. If you are looking for a specif part number, please include it with your message.